Elena Rodriguez discovered that she loves her feet being licked. 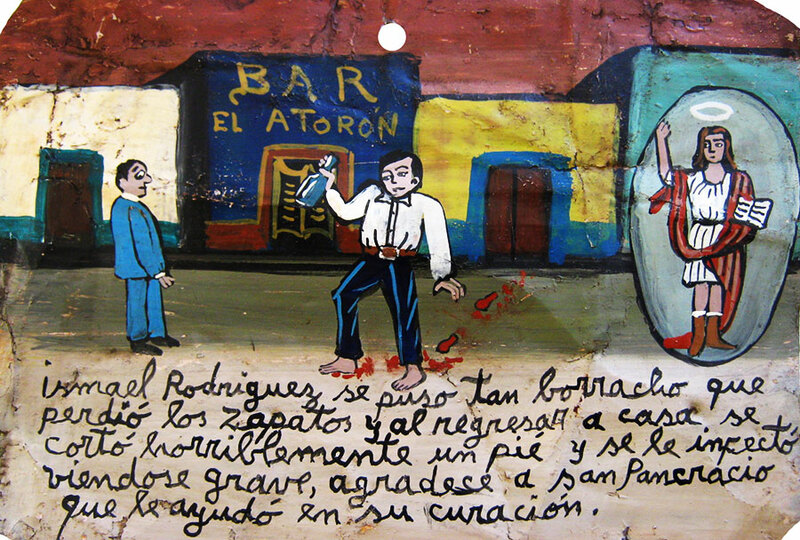 She thanks Saint Marta with this retablo because her boyfriend is very obliging. 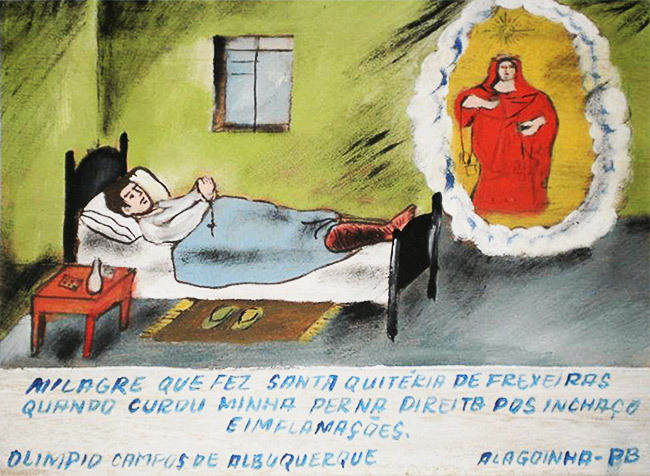 It was a miracle worked by Saint Quiteria of Frexeiras when she healed my swollen right leg. 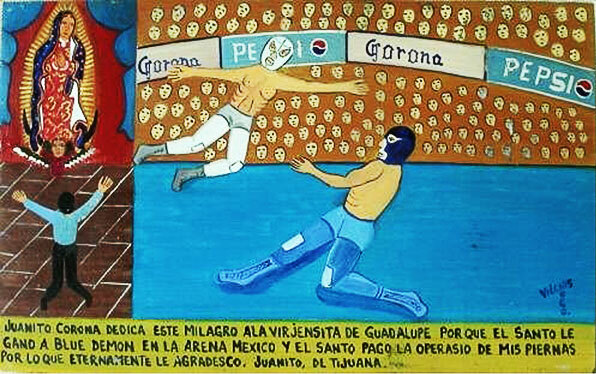 Juanito Corona dedicates this retablo to the Virgin of Guadalupe because El Santo won over Blue Demon at the Arena Mexico. 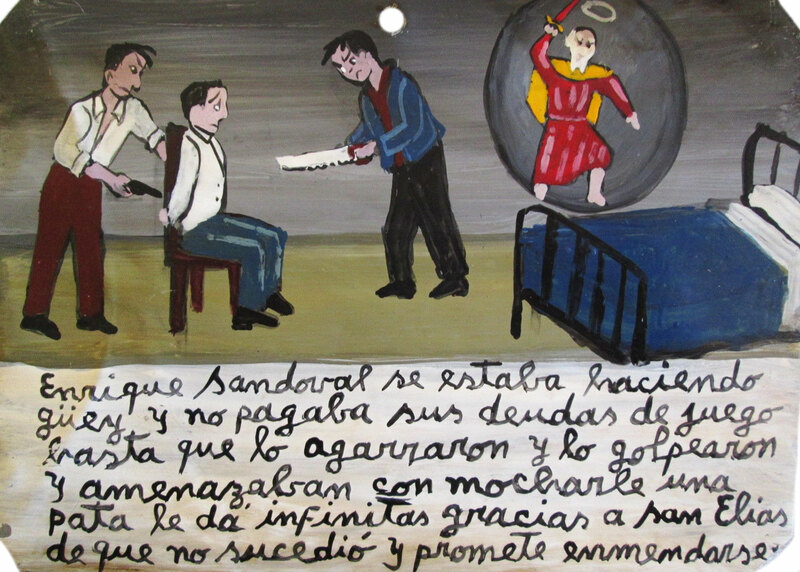 Beside that, El Santo pared for my legs surgery for which I eternally thankful. Because of our lack of money, I couldn’t build a stable. And every time when it rained, my wife brought the cow inside the house so that it wouldn’t get wet. I hated it because this damned cow used to lick my feet. I prayed to the Holy Virgin to get some money so I could build the stable. 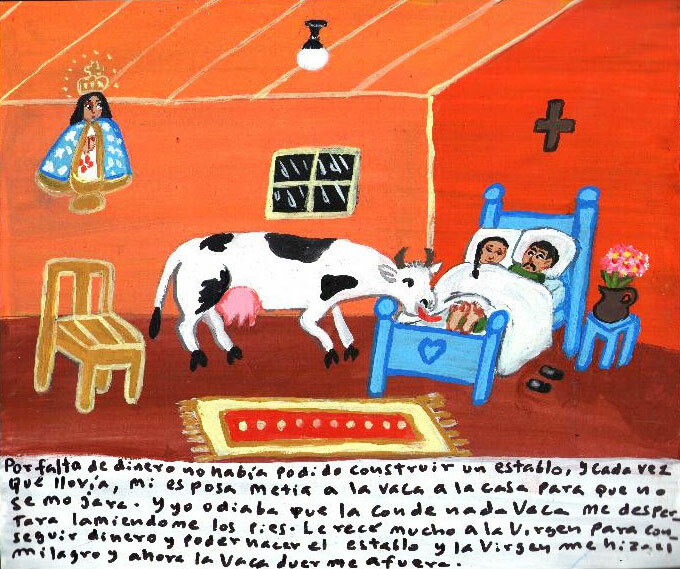 The Virgin made me this miracle, and now the cow sleeps outside. 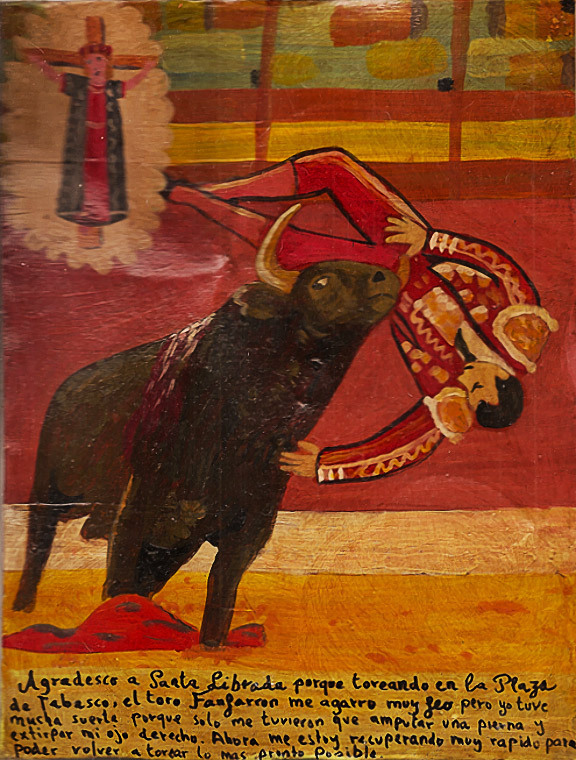 Enrique Sandoval used to slack off and didn’t pay his gambling debts. Until one day they caught him, beat him and even threatened to saw off his leg. He thanks Saint Elias they didn’t do it and promises to amend. 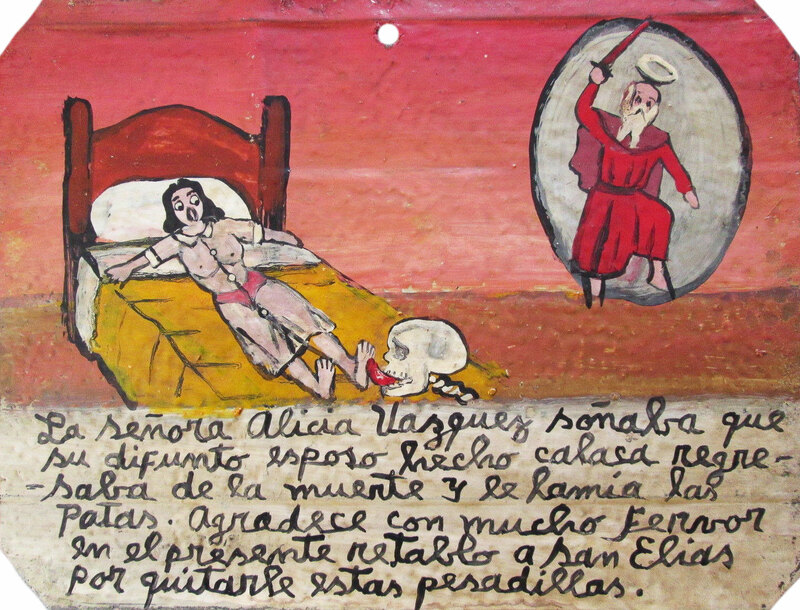 Señora Alicia Vasquez used to have a dream about her late husband’s skeleton who came back from the dead and licked her feet. 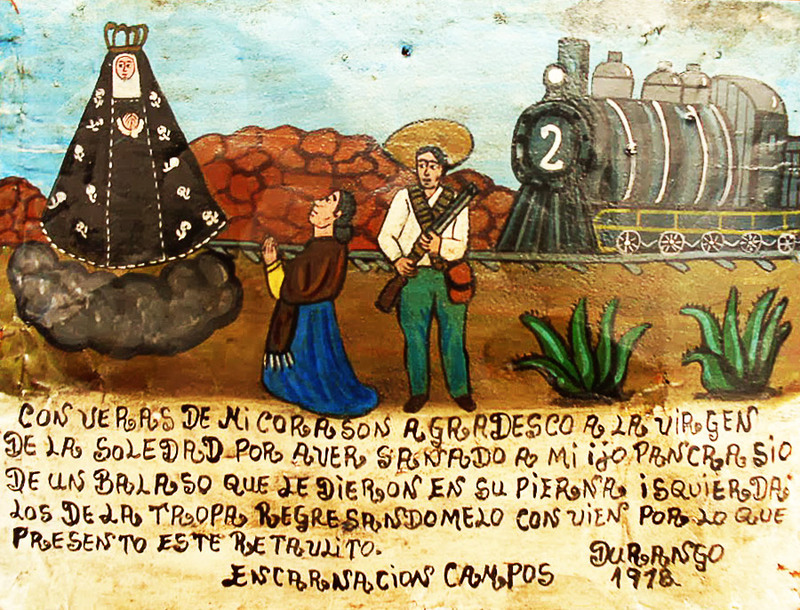 She thanks Saint Elias with the present retablo for delivering her from these nightmares. Elena R. loved when somebody licked her feet. 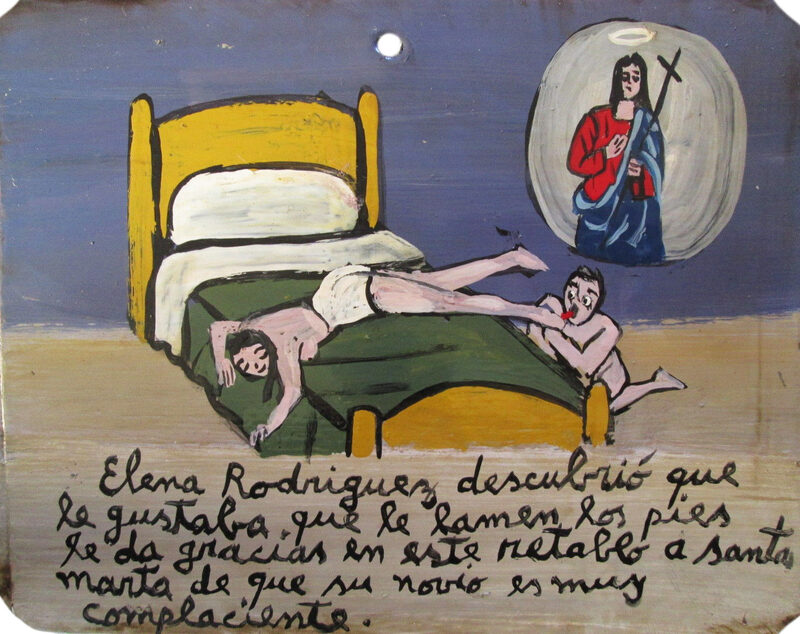 She is immensely grateful to Saint Raymond with this retablo because she met a partner with the same fetish and now they’re very happy together. With all my heart, I thank Saint Anthony the Great for working the miracle that my horse El Patro’s back legs have been cured. They were broken and wouldn’t heal. Now he’s feeling very well and runs with great agility at the ranch. 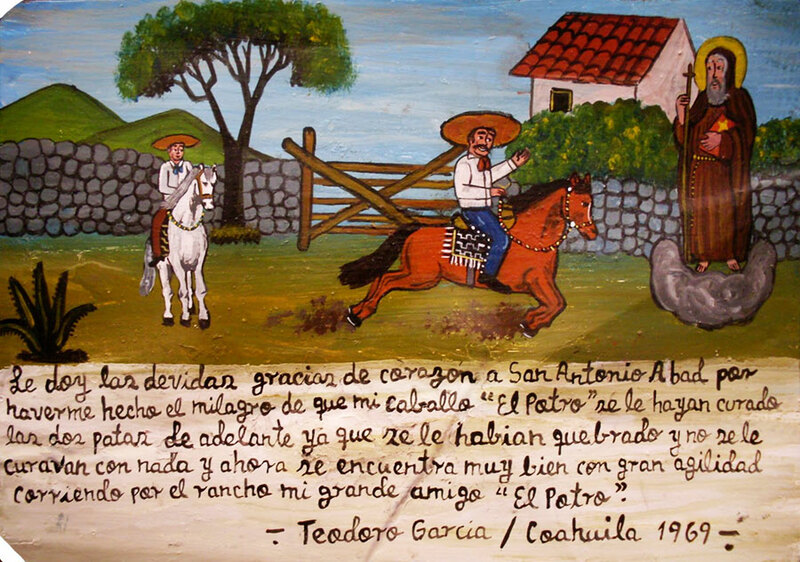 My dear friend El Patro. Ismael Rodrigues got so drunk that he lost his shoes. When he was going back home he cut his foot badly and infected it. He was in grave condition. He thanks Saint Pancras for helping him to get cured. I was swimming underwater and suddenly my leg got cramped. 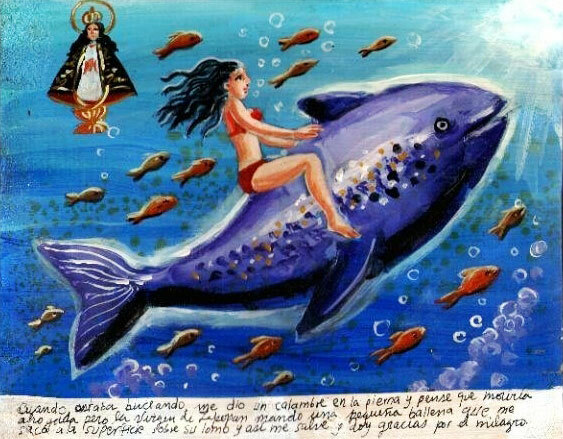 I thought I was going to die drowning but then the Virgin of Zapopan sent me a small whale. It took me to the surface on his back, and I was saved. I thank for this miracle.